Today we have an inspirational guest post with ideas for great fall fun with your kids. You'll love these ideas! We think fall is a wonderful time of year and these tips will be sure to make it even more memorable and enjoyable for you and your kids. Is there anything worse than a chilly, crisp autumn day on which your children stay indoors because you did not plan any activities? Many parents have problems when their children tell them they feel bored on a sunny day that offers so many interesting things to do. It is highly probable that your children are sure to make remarks regarding boredom at least one time during the approaching fall season. Research indicates that children only retain up to 40 percent of the topics they study in the classroom, unless their brains receive proper inspiration. The way to overcome boredom and loss of knowledge during the autumn season is to promote games and recreation, and create a strategy that keeps your children occupied when the season changes from summer to fall. The concept of keeping your children’s brains engaged during the autumn months is an essential idea, but the realization of this philosophy does not need to cost a great deal of money, nor does it require an expensive trip in order to spark their interest. The ability to imagine different things and situations does not cost any money. Autumn is a wonderful season in which you can influence your children to set their imaginations free. During the time that your children attend school, classroom agendas tend to take up a lot of time for structured activities, and extra time for creative pursuits are not as frequent. The fall months give your children opportunities to engage in creative activities without interruptions. This gives your children the chance to invent their own creative projects. 1. Create a Boredom Buster jar: When fall first approaches, get together with your children, and spontaneously think of different activities they want to do by themselves and activities they want to do with you. Ask your children to volunteer their own unique thoughts, and ask them to assist you in the creation of a jar called the Boredom Buster jar. They are sure to feel as though they are part of the project, and appreciate the idea, if they have opportunities to offer their own inventive perspectives. Next, record each person’s concepts on pieces of paper, and have the family make a decision as to which papers go in the jar and which papers do not go in the jar. Anytime a person in the family feels bored, he or she simply reaches into the jar and grabs one of the pieces of paper, and the written suggestion conquers the autumn boredom blues. 2. Make stories seem real: Even though reading seems as though it is a simple idea, it is a significant way to help stimulate your children’s minds during the autumn season. Stories cause more enjoyment when they seem real, so try to find ways that make them seem authentic. For instance, in the book Roxaboxen, by Alice McLerran, children invent a town that is not real. They create this town, located in the desert, from rocks, boxes and their own inventive minds. Read this book to your children, and then encourage them to invent their own towns with available items in your backyard. 3. The art of raking leaves: Children love to rake leaves outdoors during the autumn months. The different shades of red, orange and yellow strewn all over the grass offers their minds artistic insights, and the act of raking leaves challenges them to learn how to organize and make things look tidy. 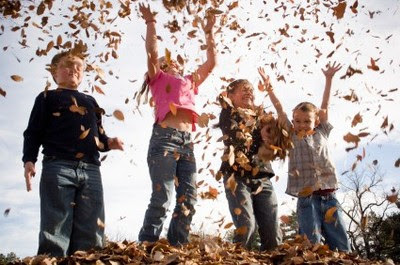 Some children thoroughly enjoy raking leaves, and they not only rake them, but also toss them about in the air. Raking leaves is a fun activity that also enables your children to spend a lot of time outdoors. 4. Go for a bike ride: Although going for a bike ride may sound simplistic, children love riding their bicycles, and the cool, clear fall days during the autumn season provide them with perfect bike riding weather. Physical exercise also stimulates the mind, and simple bike rides give your children new creative thoughts the next morning. 5. Apple picking: Plan a family outing to a local apple orchard and let your children experience the thrill of picking their own apples fresh from the apple trees. Apple picking also provides them with a good way to learn about the different varieties of apples and the various ways that different apples taste. You can teach them how to make homemade applesauce or apple butter when you bring home the colorful apples. Perhaps you want to show them how to make a delectable apple pie. Apple picking inspires all sorts of creative activities. 6. Teach your children how to make a pumpkin pie: Pumpkins and squashes love to grow during the autumn season, and this is a good time to teach your children the secret art of how to make a delicious pumpkin pie. Your children are sure to feel as though they are professional bakers when Thanksgiving rolls along, and you then have the advantage of receiving extra help when you prepare your Thanksgiving dinner. 7. Listening game: Sit down in your backyard, on your patio or at a local park and listen to all of the sounds. Ask your children what they hear and ask them if they hear the same sounds. Ask them if they want to try to imitate the sound of a bird or a dog. This game teaches your children to take some time out and pay attention to sounds they normally ignore. 8. Do a fun fall craft: Anything from painting pictures of pumpkins to making collages out of leaves will stimulate your kids' imaginations. They'll be sure to love their masterpieces. 9. Camp out in your backyard: Pack a picnic basket filled with goodies, and camp out in your backyard on a sunny, fall afternoon. Do not feel surprised if your children beg you to camp out all night. 10. Build a fort: While you are camping out, help your children to build a fort. Utilize all sorts of household and backyard items to build a strong, private fort. Use the Boredom Buster jar as a reference, and then continue to add new fall activities to the list. When children participate in creative activities during the autumn months, they develop greater self-determination, soaring imaginations and creative thoughts. Make sure you challenge your children’s minds, but keep the challenges at their levels of learning. Now that you have a few ideas to work with, spend some time with your children this fall, and help them to experience an intriguing, creative and enjoyable autumn season. Thanks again Emily Patterson for those great ideas. Head on over to Primrose Schools and check out their website--you won't regret it.